Theme 1 from Talking Mats Seminar: How do we vary the top scale? One of the key skills in using Talking Mats is getting the top scale to reflect the question that you are asking and to be consistent. WRITE IT DOWN SO YOU CAN STICK TO IT! This entry was posted in AAC, Blog, Talking Mats principles and tagged Talking Mats on June 26, 2013 by Joan Murphy. 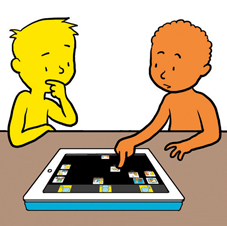 We are about to launch a digital version of Talking Mats which uses our brand new images, specially designed by a leading comic artist. We are currently in the testing phase to check how it is received by different client groups and professionals and to iron out any glitches. We are planning to launch a free taster version first. Following this there will be a Lite version with 2 full symbols sets ( £5.99) and then a subscription model with many more symbols sets and lots of additional functionality. It will also be available for Android. The final version will be launched on 12th September. This entry was posted in App, Blog, Communication difficulties, Digital Talking Mats and tagged AAC, App, Communication difficulties, digital, Talking Mats on June 26, 2013 by Joan Murphy. I want to go on holiday on my own! At a recent training Jenn Hall who is a Personalisation Development Worker, told the story of her first use of Talking Mats. She used it with a woman that she has known for some time to discuss her views about her going on holiday. The lady is in her forties and has Downs Syndrome. As she came to the people symbol she looked at it for ages and then placed it in the middle column explaining that she wanted to go on holiday on her own and visit her brother who lives in Spain without her parents. she had never been supported to do this and it was what she really wanted to do. She also put the food in the middle column explaining that it was hard to understand the menus when she was abroad and that she wanted to learn a few basic words in Spanish. Jenn said that the Talking Mats really enabled the lady to express what she wanted not just go along with the status quo and for those around her to appreciate and understand her views . The Talking Mats has supported discussion with the family to enable this lady’s wish to come true . Hopefully she will have her first successful holiday with her brother visiting him all by herself. This entry was posted in Blog, Communication difficulties, Learning disability, Participation, Personalisation, Self directed care and tagged Communication difficulties, Learning Disability, Personalisation, Self directed care, Talking Mats on June 14, 2013 by Joan Murphy.